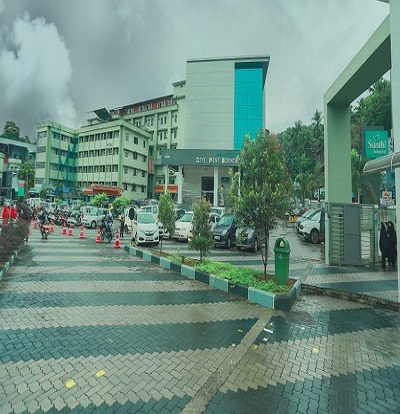 Santhi Hospital based in Omassery, Kozhikode, Kerala was founded under the aegis of the Islamic Welfare Trust – a multi-faceted charitable organisation with the sole objective to uplift the under privileged sections of the society through education and medical care. Santhi Hospital has emerged as one of the most trusted and prestigious healthcare providers of Malabar over the last 28 years & is equipped to meet medical emergencies with the support of competent professionals, modern equipment and advanced facilities including 350 beds, 8 Operation Theatres, 11 labour suites, Level 3 NICU, 20 critical care beds and other amenities. Over the years Santhi Hospital has come a long way with commitment and dedication, keeping pace with the latest advances in medical science and technology. The hospital provides comprehensive healthcare services including general medical and surgical services. Santhi Hospital offers comfortable, well arranged rooms, competent and caring clinical and paramedical staff & facilities that ensure utmost comfort to patients and their companions. Our team of efficient professionals create a caring environment in the hospital. The mission of Santhi Hospital is to provide excellent quality healthcare facilities at an affordable cost to the common man and the underprivileged sections of the society. Omassery is located 30km southeast of Calicut city. It is known as the gate-way to the hill ranges of Western Ghats in Malabar. It is showing rapid development and is well connected by road to the other parts of the state and the neighbouring areas of States of Karnataka and Tamil Nadu. The nearest Airport is Calicut Airport which is 40 km away and the nearest railway station is Kozhikode which is 30km from here.